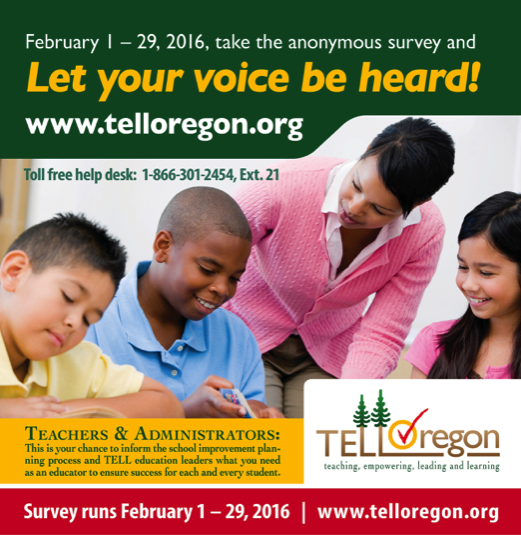 On February 1, Oregon will be launching the 2016 TELL survey, an anonymous survey on teaching and learning conditions. Each school is receiving a packet with codes and directions in preparation for the month long window that provides online access for all licensed school-based Oregon educators to participate. This is the second administration of the nationally developed survey in Oregon administered by the New Teacher Center (NTC) in partnership with the Chief Education Office, the Oregon Department of Education (ODE), and educational organizations including the Confederation of School Administrators (COSA). In 2014, more than 19,000 educators responded to the Oregon Teaching, Empowering, Leading, and Learning Survey (TELL) providing critical baseline information to help state and local leaders shape education policy and consider strategies to address key educator priorities. Some of the themes heard from educators related to: interest in peer-to-peer mentoring and collaboration, professional development, class size, and educator leadership. Use of these data by school and district leaders is intended to drive productive discussions on critical aspects of the conditions for teaching and learning in local districts and schools. For more information about the TELL Oregon Survey, and to track individual response rates by school, please visit www.telloregon.org.